I am sure you have been through the experience where you have a friend of yours that needs help and your not sure what you can do to help them. Many times in life you will be called upon to help a friend in need whether they are dealing with extreme grief, anxiety, depression or a destructive behavior. Sometimes it can be overwhelming trying to help. I know that many times you might be thinking to yourself “I want to help but I don’t want to say the wrong thing” or “ I just don’t know what I can do to reach this person”. You may be just worried because it’s something new to you as well and are unfamiliar how to lend a helping hand. I have received hundreds of emails from people who are in the same situation as you. They want to lend a helping hand but are not sure where to start. First know that you are in this person’s life for a divine reason and you should not ignore the problem. Instead the best thing to do is to offer some help and support right when you notice that this person needs help. The best way to communicate is through lending a helping hand without being judgmental. Communicate with the person and let them know you love and care and will be there for them no matter what. Here are some tools you can use to help that person. Find Out What The Problem Is: Many times a challenge that someone is dealing with goes far deeper than what is being shown on the surface level. For example someone who is grieving the death of a loved one might not be crying just because the person passed on. They might be dealing with deeper struggles like holding themselves accountable for the persons passing (Survivors Guilt). They may be questioning if they will ever see the person again or if Heaven really exists (Loss of Faith). They may even be dealing with not having closure over the loss of their loved one or not being able to say goodbye. Another example of this would be someone who is dealing with an addiction. They might appear that they are addicted to the substance itself but there might be something greater that is underlying. They might have anxiety or depression that triggered the addiction and helped to sooth the pain. They might just have gone through an emotional struggle such as a divorce or depression and might have issues dealing. They might also be having some past regret from childhood or deep emotional scars. Start By Turning The Negative To Positive. The best place to start when offering advice is to turn the negative situation at hand into a positive one. Looking for the silver lining in every situation can help things be turned around very quickly. For example a parent who is dealing with survivors guilt. Reassurance is the best way to turn around guilt and heaviness. Offer some words of reassurance of the relationship that person had with the departed. Sometimes after a passing memories become so clouded and in the heat of grief it can be very challenging to see the light at the end of the tunnel. By offering the strong loving heartfelt memories they shared it will help the person change their thoughts around. If the person has lost faith help to lift them up by offering some inspiration and spiritual experiences you have had in your life that lifted you up. If the person is dealing with addiction or emotional stress and baggage here are some things you can try. Encourage them to release the heavy emotions from the past and explain to them what it is that has really been holding them back. Talk about what it would feel for them having all that stress and heavy weight lifted from their shoulders. Explain to them it’s never too late to break the pattern and to change things around. Sometimes a person will get so caught up in a destructive or unhealthy pattern that they will lose sight or forget they have the power to change it around. Reminding them that they are strong and have control of their life and actions will encourage them and give them hidden strength. Offer The Advice Of A Friend. 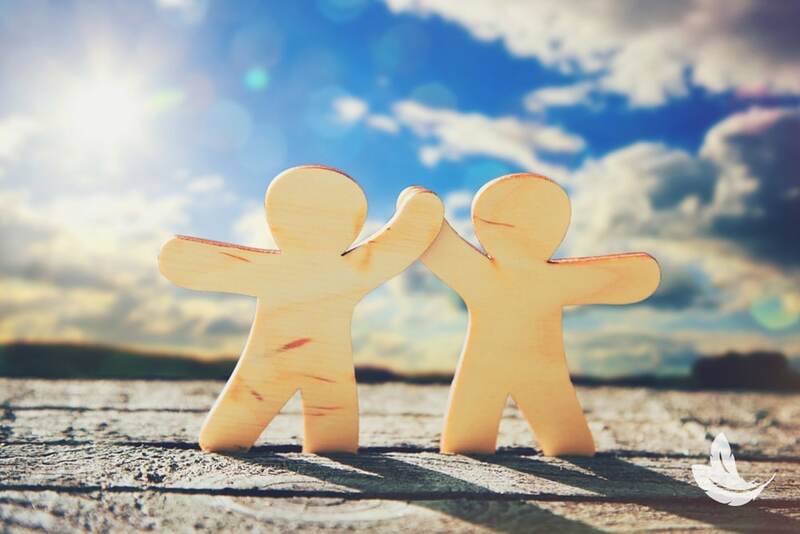 – Sometimes the best thing you can do to help a person is to introduce them to someone such as another close friend or trusted family member who has gone through a similar struggle or challenge. Allowing that person to hear from someone who was once in there shoes and overcame the challenge is inspirational and encourages them to do the same. We might never know what that person is truly dealing with on the inside and sometimes it’s hard for a person to take advice form someone who has never gone through what they have. Being able to have someone they can talk to and relate with is healing within itself. It will show that person that if they went through it and succeeded so can I. Always Stay Positive. It’s important that through the whole process to be an inspiration to the person that you are helping. Pointing out what they did wrong will not be as big of a help as showing them everything that they are doing right. Try your best to stay away from judging them or pointing out the wrongdoings. Instead encourage and support them by showing and encouraging them the entire time that they are doing everything right. By encouraging that behavior0 you will show the person the path that they need to stay on. Chances are they already know what they did wrong and they are looking for the ‘right path ‘ to take. Positivity works 100x better than negativity especially in situations like these. Be sure to ground yourself and not get emotionally upset with the person or the situation. Remember that you are there support system not disciplinarian. They are coming to you for help , love and support. Handle them like glass with firm but loving guidance that focuses on the positive road ahead. It’s Ok To Seek A Professional’s Help. Most people will hear this and feel uneasy at the word ‘professional help’ but it’s not a bad thing. Part of the healing process for anything is building a strong support team of family friends, and life teachers. The more people that you can have on your side the better. Explaining to the person that professional help is not accepting that you cant handle the problem yourself. instead it’s an additional tool that you can use to heal and improve your life. Try Alternative Therapy. if professional help Is not something that is helping try something alternative for that person. Everyone is different and not one ‘formula’ or ‘path to healing’ works for everyone. Sometimes exploring different options is the best way for that person to get the support they need while also learning more about themselves. You can remind them not to give up, miracles happen when you least expect them to . Encourage them to know that when they do find the option that works best for them healing is just footsteps away. Ask Heaven For Help. While you are on the journey to helping your friend or family member know that Heaven will be helping you along the way. Send that person positive thoughts and energy throughout the day. Pray for them and ask Heaven and your Angels to help you to help them. Remember that while helping someone to heal you will also need to help yourself stay positive and strong. Ask Heaven and your Angels to send you the energy, willpower and motivation to help and know that they are with you. If you enjoyed this blog post I would like to invite you to join my “Email from Heaven” monthly newsletter by clicking HERE. Each month I will send you my newest blog posts, videos and also a free gift to your inbox. I hope that my emails help you on your spiritual journey and help you stay connected to those you love and miss in Heaven.